Sonoma County‘s Press-Democrat dives gradually into Slow Food. In California, farmworkers continue to die of heat; OSHA law not helping workers due to lack of enforcement. American man forced to sell Canadian farm that has been in the family for 99 years. But heck, the internet is so blissfully anonymous, I figured why not? Even if you’re one of these people who, in my mind, infringes upon common-sense farmer’s market etiquette, I’ll never know who you are! And maybe it’ll be refreshing for you to hear a farmer’s perspective, even if you dismiss me as easily offended and somewhat huffy. Regardless, I hope you’ll pardon my attempt to lay down the law. 1. Don’t steal. This should be obvious, but on Sunday I watched people sneak cherry tomatoes out of our selling basket — and then slink away guiltily when they noticed I noticed. We do have samples of cucumbers and apples out for customers to try, bristling with health-code-required toothpicks in an obvious sample bowl. If you ask to try a tomato, I’ll absolutely respond with an emphatic yes. But don’t take them without asking. You wouldn’t bite into an unpaid-for apple in a grocery store, would you? 2. Control your kids. We love children, and I think it’s awesome that parents take kids to the farmer’s market — what a great way to get them excited about eating healthy foods! (I bet you didn’t know this, but I was on a pretty strict picky-eater diet of meat and potatoes until I went to college. When I became a vegetarian as a sophomore, my mom asked pointedly “What are you going to eat?” Anyway, the point being: it’s taken me a long time to learn to eat a healthy variety of vegetables, and if your kids are eating them now, I applaud your parenting skills.) Still, it isn’t okay when one kid eats the entire sample bowl’s worth of apples…. or starts popping cherry tomatoes into his mouth like it’s candy, when we said feel free to take one. So: keep an eye on your kids, encourage them to use ‘please’ and ‘thank-you,’ and we promise to shower these healthy-appetited children with attention and free samples. 3. Don’t treat us like Costco. In my family, “Costco” (or Sam’s Club) basically translates to: free lunch. We hit up all the samples, sometimes a couple of times. But Costco operates on a slightly different scale than we do; it should come as no surprise that the farmer’s market ain’t a bulk warehouse store. Obviously, samples are still free. There’s no requirement to purchase a cucumber once you’ve tried the sample. But it’s not entirely friendly — or in the farmer’s market spirit — to beeline for all of the market’s samples in a slap-dash taste-and-run. Think of farmer’s market sampling as an event along the lines of a fine wine tasting. Hold the Armenian cucumber morsel up to the light, examining the color and consistency. Take a deep whiff, looking for notes of caramel and bouquets of citrus. Swish it around in your mouth five times before swallowing. OK, so you don’t have to take the cucumber that seriously, but a little “mmm, that’s tasty!” or “huh, interesting” goes a long way to making your farmer feel good. And a farmer who feels good is more likely to put out more free samples! 4. Don’t roll your eyes. Ever. Even if my radishes cost more than radishes cost in New York City, it’s not okay to roll your eyes as though you are way too good to buy my ridiculously overpriced, exceptionally unworthy radishes. Remember, I’m not a used car salesman who happens to be hawking roots at the farmer’s market. I grew these things, and growing (e.g., sowing, sprouting, weeding, watering, and harvesting) is hard work! 4a. Don’t mention that grocery stores may be selling Vegetable X cheaper. Safeway’s Vegetable X probably traveled hundreds or even thousands of miles to the store, is probably a week old, and was definitely grown by some highly mechanized corporate behemoth. Yes, my vegetables may cost slightly more than Vegetable X, but you get what you pay for: freshness, organic growing procedures, and environmental sustainability. I’ve got photos of the farm on display, and you’re also welcome to visit Foggy River Farm at any time to see where and how your veggies are grown… can you say the same for Vegetable X? 5. Don’t pee on buildings. Walk the extra five minutes to the nearest public toilet. I’ll admit: the person I think I caught doing this was a fellow seller. I won’t repeat who it was — but still, come on, people. 6. OK, time to tone down my sass. How about introducing yourself? I love knowing your name, and I love repeat faces at the farmer’s market. In fact, Emmett and I get ridiculously silly about repeat customers — we’ll save extra beet greens for a regular we know who really likes them, we’ll throw in an extra cucumber destined for the salad of a regular lettuce-buyer, and if we know you have kids, we’ll inquire after them. Be friendly to us, and I guarantee we’ll be friendly in return. P.P.S. — Gosh, I wish the color quality of uploaded photos weren’t so awful. 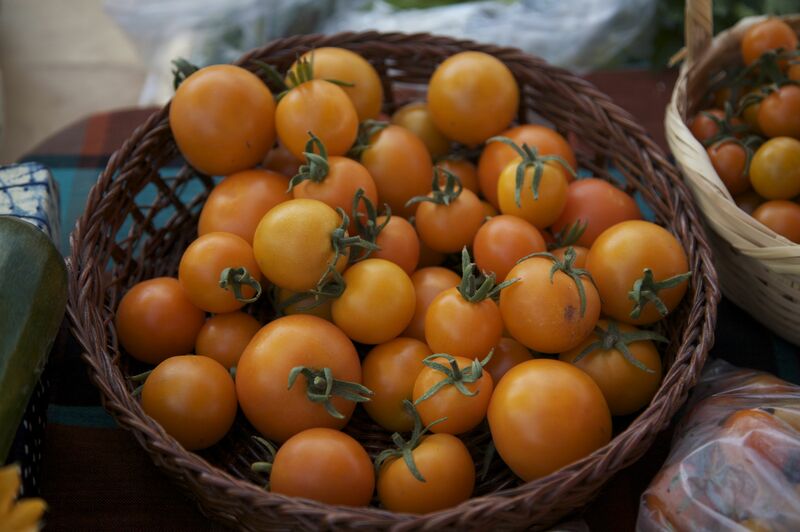 In RAW format, or even in iPhoto’s exported JPG, these Sungella tomatoes are a brilliant deep orange — picked at the pinnacle of ripeness, I swear!